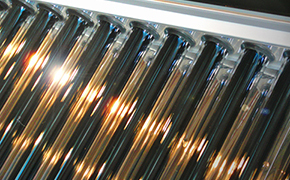 We build high-quality efficient solar water heating systems for large buildings. We believe that this is where the highest level of savings are available and the most effective strategy from an environmental perspective. We are not brand specific, nor product specific. We select the best performing product for our customer’s site specific needs. We do not promote any particular company’s products. We design and install customized systems that best suit each product. Is it making a difference? Yes. Heating water requires a lot of energy, most often fossil fuels. Water heating accounts for about 30 percent of an average household’s total greenhouse gas emissions. By reducing this significant source of carbon emissions using proven technology with very low embodied energy, we believe we are making a real difference.